Analog synths, meet spacey, abstract touch controls. And Konkreet Labs Performer – the futuristic iPad controller app – meet everything else, including, for those not lucky enough to own racks of modulars, MIDI. 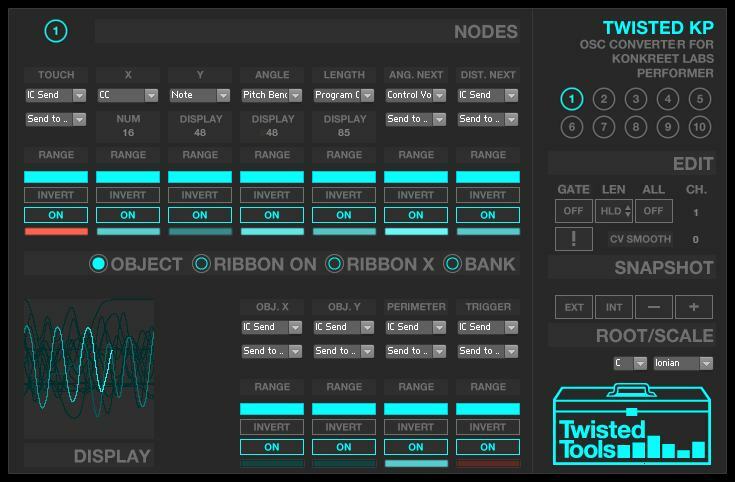 Twisted KP is effectively a clever helper app, taking in messages (as OSC) from the brilliant Konkreet Labs Performer iPad app and translating them into things you can use with everything else — MIDI, analog control messages, or if you’re a Reaktor user, internal Reaktor IC messages. For Reaktor geeks and analog owners, it’s a godsend, but it’ll also work as a Reaktor standalone tool if you just want to make some MIDI control magic. You do need to own a copy of Reaktor (cough, NI, please, please find some way for these guys to distribute their stuff). And for Control Voltage, you need a DC-coupled audio inter— actually, if you own analog, you can probably go figure that bit out. If you don’t, jut marvel at the sonic goodness. CV audio interface: Control voltage output made possible by using MOTU 828MKII interface. US$9, and so long as you’ve got a copy of Reaktor, you’re good to go. Reaktor geeks should have an especially good time with this. Insert here my normal rant about the fact that the OSC protocol implementations in software should be flexible enough that you can do this with everything, and that OSC messages should be clear enough and have a degree of standardization such that this sort of thing is possible simply by taking in incoming messages, even if you haven’t seen them before. In the meantime, though, this works now.